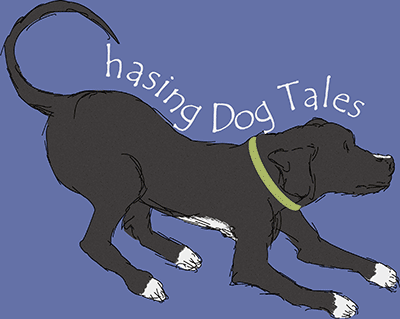 For a dog owner, there’s nothing more joyful than coming home to a happy, wiggling pup. Until—you walk into the kitchen and find that she’s knocked over the trash can, shredded papers and containers, and pretty much consumed everything even remotely edible from the can. Urgh! You know you’re not supposed to correct a dog after the fact because she won’t understand why she’s being corrected, but it’s pretty hard not to be mad while facing a refuse debris field while she’s looking up at you with a grin. What do you do? How do you stop your dog from getting into the trash? This was one of my most challenging problems with Haley. She’s always listened well and responded quickly to training, but sadly, she was a trash hound. She would raid the trash when we were gone and at times would boldly sneak into the kitchen while we were at home to forage for goodies from the garbage can. Once, she even ate an entire turkey breast carcass! 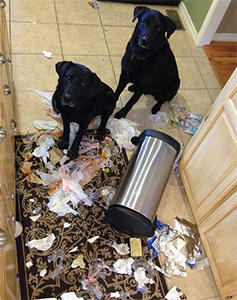 Some dogs will get into the trash because of boredom, but most dogs smell something tempting and quickly learn from experience that the trash can contains a treasure trove of tasty tidbits and interesting things to chew on or shred. It’s frustrating when your dog does this, but it may help to know that your pup doesn’t do this out of spite. It’s instinctual for dogs to scavenge for food. They are opportunists (somewhat like us) and they would survive in nature by foraging for food or leftover scraps. However, since your dog is living inside your home rather than scavenging in the wild, you’ll want to keep her safe from ingesting anything dangerous from your trash. 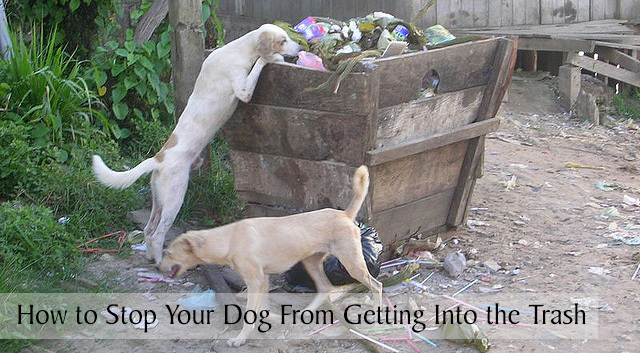 Here are some ways to prevent doggie dumpster diving. 1. Keep your trash can inside a cabinet. Yes, that’s a pretty obvious solution if you have the cabinet space, but many people must use free-standing trash cans. 2. Purchase a trash can with a tight fitting lid. There are many types and brands of sealed or lidded trash cans, although some dogs easily master these and some have even figured out how to open cans with step-on pedals to raise the lid. 3. Create a homemade booby trap type of deterrent. A common method is to stack some empty soda cans in a pyramid with one end of a string tied to one of the cans on the bottom of the pyramid and the other end of the string tied to a treat that is dangled on top of the trash can. If the dog takes the treat, the cans will fall and hopefully create a negative association with taking things from the trash. This has worked for some dog owners, but I would be afraid my dog might eat the string. 4. Purchase a deterrent device online or from a store. Devices such as the Snappy Trainer can be safe and effective. There are also ScatMats and motion-activated devices that use compressed air or sound that can deter pets away from the trash can. Evaluate these devices carefully before purchasing to make sure they’re safe for your dog. Some products aren’t recommended for sensitive dogs that are easily frightened. 5. Train your dog to stay away from the trash can. This is a good option for when you’re at home with your dog, but even a well trained dog may not be able to resist the enticing contents of a trash can when you leave the house. 6. Remove the trash can from your dog’s reach. Placing the trash can in the garage or behind a closed door or baby gate is often the best solution. What worked best for Haley were numbers 5 and 6 above. I wanted her to stay away from the trash can when we were at home, but I felt that it was expecting too much of her to ignore the can if she was left home alone, especially if there was something very tempting in the trash. Here’s how I trained Haley to ignore the trash can. Observe your dog’s behavior whenever she’s in the kitchen with you. Any time your dog approaches, sniffs or looks intently at the trash can, give her a verbal correction such as “Uh Uh” or “No” in a stern voice. If your dog knows the Leave It or Off command, either of those will also work well to let her know to back away or ignore the trash can. Correct your dog as soon as she focuses her attention on the trash can. Occasionally, reinforce the training by placing something she finds delicious near the top of the can to bait or test her. Be prepared to correct her if needed, but she may surprise you with her good behavior and ignore it. I still keep a close eye on Haley around the trash can, just in case she ever needs a reminder, but she’s graduated from trash hound to trained hound! When we leave the house, I place the can behind a baby gate so we don’t have to worry about her being tempted or eating something that might make her sick. If your dog gets into the trash, even when there’s nothing edible inside the can, she may be bored or need more exercise. A good walk or some active playtime before leaving the house can release some of her excess energy. Also, giving her a frozen, food-stuffed Kong or toy that she can work on while you’re gone may keep her busy and out of trouble. Another reason some dogs get into the trash is to gain attention. They have learned that stealing something from the trash may result in an exciting game of chase. When attempting to stop your dog from getting into the trash, prevention is the best approach and remember to only correct your dog if you catch her in the act. Have you had issues with your dog being a dumpster diver? What method worked best for you? Great post! However, I would be afraid that the booby trap might cause some psychological problems due to the fear caused by the big pile of cans clattering onto the floor. I think that simply keeping the trash can out of reach is the best solution. If the trash can is kept in a cabinet, it is easy to install child-proof latches on the cabinet. If the trash can is too large to be kept in a cabinet, it can be kept in the garage or behind a closed door as you suggested. As an added precaution, I always take the especially yummy-smelling trash (anything with the smell of meat) directly outside to the trash bins meant for curbside pick-up to avoid needless temptation. I agree Rachele, I think the best solution is to keep the trash can out of reach, even though it might not always be convenient. Great tip about taking anything extra tempting directly to the outside trash bin! You make such a great point, Nick! Sometimes we do expect too much from our dogs, even if they’re fairly well trained. I always try to see a situation through Haley’s eyes when she has a behavioral issue and I almost always see where I’m the one that failed or didn’t properly set her up for success. Thanks for contributing such a valuable perspective. ?? UGH! We went through a horrid phase with one of my huskies. I tried so many of those things to keep her out of the trash, but huskies will be huskies and she always seemed to find a way!!!! Luckily she is over it now!!! I’m glad she grew out of that phase, it can be very frustrating. It’s amazing how determined and clever some dogs can be when raiding the trash can or counter surfing. I feel lucky that we’ve never had much of a problem with this…shredded tissues was the bigger problem. Yes, that’s a pretty common problem too. I’m glad I didn’t have to worry about Haley raiding the kitchen and bathroom trash cans. Luckily, she’s never had a tissue fascination. My sister’s Golden Retriever will gobble up tissues or paper towels if she’s ever given the chance. Great tips I too have a dog that likes to get into the garbage. I struggle with it. I do have a wooden trash can holder in the house. Then when I take the trash outside I have to put the garbage in another garbage can, he will try and knock that over until I finally burn it. He sounds pretty clever and determined, lol. Thanks for stopping by! I have the exact same problem with the kitchen counter, Zack is now able to get to just about any corner of it to scavenge a goodie. I’ve tried training and am reluctant to scary deterrents. So the only thing left really is to keep stuff off the counter. Which is harder than it sounds … especially if I’m in the middle of cooking and someone knocks on the door. What might be cool is to have a pull-down ‘wall’ above the counter, like a roll-top desk, so I can make the counter immediately unavailable! It is hard to keep everything put away all the time and some dogs are so quick at snatching something yummy off the counter. Training must be a challenge for people that own large dogs like Great Danes since their noses are right at food level. I wonder if one of those large dome-shaped lids made for covering picnic food would deter Zach. I had one dog that got into the trash because he was dealing with separation anxiety. The kitchen trash was secured, but he’d go pull tissues (uck!) out of the bathroom garbage whenever we left him alone. Easy solution: keep the bathroom doors closed. I have some friends that have the same problem with their dog, but she’ll go into the bathroom even when they’re home to rummage through the trash can for tissues. You’re right Susan, it doesn’t get much easier than closing the doors before you leave the house. We have a cat that gets into the kitchen trash. We bought a pretty sturdy trash bin and taught all three of our pets the kitchen is off limits by using “out” and squirting them with water, but Beamer will still get into the trash when we are not home. The only way we can stop him is to put him in another room with the door closed when we leave, similar to putting a dog in a kennel. Ace used to get into the trash when he was younger, although it might’ve actually been Beamer who knocked it over and then they both raided it. I’m not really sure how I stopped Ace other than moving the trash to the bathroom for a few years where I could just close the door and he couldn’t access it. Kind of a pain, but that’s what we did. Eventually, he had no habit of getting into the trash and just matured and now he would never consider it. Beamer, however, is still a problem and always will be. Great post! I’ve been having a lot of trouble with this lately, so this was a huge help. Thanks so much for sharing! Thanks Penny, I’m glad you stopped by today and found the article helpful! My dog has always counter surfed so we make sure to keep the counters clear. Last week he chewed up my husband’s big plastic lunchbox to get to whatever was in that. He’s never don’t that before. He has also gone into the trash at night recently. Today was the worst. He somehow opened the pocket door (we keep the trash in the powder room when we’re gone) and got into the trash! I’m not sure what to do. Is it a phase or is there maybe something wrong? Hi Maura, I’m sure nothing is wrong as long as your pup’s getting enough calories in his diet and he’s not raiding the trash can because he’s hungry. Of all the posts I’ve written, this one gets the most hits because it’s such a common problem with dogs, so you’re definitely not alone. Some dogs are more determined to get into the trash, especially once they discover how many yummy things can be found in there. The good news is, there does seem to be a trend that many dogs outgrow the problem as they get a little older. I would make sure the trash can is secured when you leave the house and work on training when you’re at home. When I was training Haley, I would occasionally set something really tempting right on top, so I could catch her in the act and correct her if she sniffed the can. The goal is to have them completely ignore the can, no looking at it or sniffing around it. Also, for some dogs it’s a boredom issue, so you might want to try more exercise or give him a frozen, food-stuffed Kong when you leave the house so he’ll have something to work on while you’re away. It can be challenging with our little scavengers, but hang in there and keep on working on the training. Don’t feel like you’ve failed with the training if you still need to secure the trash when you leave the house. A lot of dog owners do that, including me. ? This is difficult for me because my husband likes to share all his meals with our dog. He’s always tossing her a piece of his food, or putting a bowl down for her to clean and it creates a begging problem which really gets under my skin. When I’m the one in the kitchen I tell her to stay out and whenever she looks at the trash I tell her “no”, but then my husband does the opposite. However when we leave the house she sometimes goes through the trash looking for food, and it’s usually after she’s had a taste of whatever my husband is eating. The only option for me moving the trash is to put it outside, but we have a carport, not a garage, and then it attracts all the neighborhood bugs ;). Plus sometimes I just forget. When she goes through the trash she knows she did something naughty… It’s like her primal nature just took over and she couldn’t help it, haha. Anyways, I feel like the best option here is my husband and I need to work on some sort of system, and in the mean time I maybe I’ll try a homemade booby trap. Hi, Tori! I wonder if a locking lid trash can might work since it’s not the best option to put the trash outside. 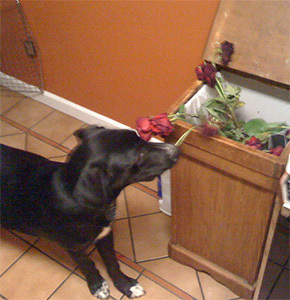 You’re definitely right about it being a primal instinct for dogs to forage for food, it’s just not fun when they forage in the kitchen trash can, haha! ? Good tips! We keep our trash up on a table by the back door to deter the dogs from getting into it. I try not to put food into it unless it will be going soon to keep the temptation down. Sometimes I forgot. There is nothing like having my 14 year old blind Jack Russell knock it off to get at what I put in there to remind me. That’s my strategy too but then sometimes I slip up and forget to move the can or forget there’s something really tasty in there. I’m so lucky that Haley was fine after she once ate an entire turkey breast carcass! My 8 y/o Aussie is the WORST trash diver. Every single time I leave he gets into either the trash or some other such food type item. He has gotten sick from this. I suggested that we get a kennel or a “house” like my younger dog who is owned by my daughter. The idea is that my Aussie gets through EVERY booby trap! He has clawed up doors, walls and tables trying to get to what it is he wants. It is very frustrating. He not only gets into foodies but also finds himself up on whatever surface he pleases to watch out the window (understandably) but it’s the combo of trash diving plus desk collapsing that has me thinking kennel. He is not kennel trained but has found that an old dog can learn new tricks. Between my teenage daughter and her 1 y/o Boston they keep the ol Aussie on his toes. It has also brought a sort of new beginnings. The Aussie will now eat apples thanks to the Boston who loves them! They play a lot and share very well. I’ve even caught the Aussie trying to “get in his house” when the kennel is clearly made for a Boston! Lol But I don’t want to traumatize the Aussie with a kennel. So basically I keep the dog food up as high as I can also in a lidded container. The trash has become daily Walmart bags that get brought out to the trash every time we leave. I replaced the desk issue with a chair under the window. But every so often he finds some hidden licorice or we forget the Walmart bag when we leave. And every time he gets it. Just frustrating because we have already gone to extreme lengths to prevent this behavior. I want to try the reprimand while going for the trash…thank you for this article! It really helped steer me in a good jump off point! Be well ? Aw, it sounds like your daughter’s Boston Terrier and your Aussie are getting along great! Aussies are so smart and determined (as you know) it’s sometimes hard to break those bad habits. For Haley, the key to helping with her trash can raiding was catching her in the act of eyeing the can. If you can reprimand your Aussie anytime he looks at the bag, sniffs near the bag or gives it any attention at all, that would probably help. Sometimes the temptation is just too strong for some dogs to ignore a yummy smelling can or bag when you leave the house. Haley is one of those dogs too, so we just move the can when we leave, like you do. Since your Aussie is somewhat interested in the Boston’s crate, you might want to try one for him sometime. You can start by making it cozy and comfortable with a bed inside and toss a few treats in there every now and then. I would leave the door open at first until he adopts it as a comfortable place to nap. Then work on closing the door for short periods of time to see how he reacts. You wouldn’t want to keep him in there for long periods of time since he’s a high-energy dog, but having the crate could come in handy for those times when you want to make sure he’s secure and can’t get into something dangerous. Good luck with the training and enjoy your two pups, it’s wonderful that they’re getting along well and having fun together. ? My dog gets into anything she can, especially the trash! we tried everything, even buying a trash can with a locked lid but she still managed to get in there. The only thing to stop her is to put the trash can on the table where she cant reach, but even then she sometimes manages to get up and eat whatever food we may have left up there and we just dont know how she does it, shes a small dachshund and terrier mix so we have no idea how a dog that small can reach up there. She sounds really determined, lol! Have you ever set up a video camera to see how she’s getting up there? That might be interesting to watch. ? My Jack Russell mix is a serial chewed. It doesn’t seem to matter whether she has toys to play with and chew on, if it’s something she isn’t suppose to do, she does it anyways. She chews and eats things, in fact just last night I was in the bathroom and I come out to find she got into the trash and got a hold of the paper and plastic wrapping from ground pork sausage that I had also put green onion stalks in. Living in an apartment I don’t have the space to put the trash can behind a door or even under the sink, I’ve tried spraying the trash with butter cherry to no avail, I’ve tried putting the vacuum cleaner up against the trash since she dislikes it, she still sneaks something out, I finally had to resort to Tabasco sauce since its the only thing she doesn’t like in her mouth but I have to keep replacing it. I’ve used the stuff on various things but as with most things I need to continually replace the sauce on objects. I can’t always put Tabasco on somethings though because of horrible staining, she has chewed my wall while I was sitting right there, torn up the carpet and chewed out the padding underneath, being deaf is very hard because you don’t hear them doing things they aren’t suppose to do. Everyone keeps telling me to put her in a crate but I can’t because then she can’t alert me when someone is at the door or something is wrong (which is what I’m trying to train her to do, since I’m training her to be my service animal on my own). Hi! It sounds like your JRT has a lot of energy, which is pretty normal for the breed. I have a couple of ideas that might help. Have you tried a locking trash can? They make some models that are “supposed” to be dog proof and maybe one would work for your pup. I’m also wondering how much exercise she gets. Since they do have a ton of energy, burning off some of that energy might go a long way in preventing some of her destructive chewing. Another idea is to check out some of the food puzzle bowls and treat balls on the market. It helps slow them down because they have to work for their meals or they can keep a dog busy for quite some time while they work on getting the treats from the toy, all while burning some energy too. Maybe increasing her exercise and giving her something else to do in order to get something tasty might break her from raiding the trash can. If you get a chance, stop back and let me know if that works. It’s awesome you’re training her to be your service dog and I wish you both nothing but success! Thanks, I’ll be sure to find some puzzle toys, she’s currently got three different sized chew bones (Sort of like the nylabones with the smooth ridges in the middle), two tennis balls, one of which she’s balded and ate the green felt off (she had green poop for a few days after that one), she’s also got a giggle ball, it makes a few giggling sounds when it’s moved around. She has two stuffed ducks, one of which is taken to bed with her, she had a toy that giggled when you shook it but she’s managed to bust the giggler machine. I just recently bought her a Sumo, which is the competitor brand to the Kong and she loves it so much she’s chewed the top off. The darn brat likes to chew! We do go on walks every couple of days, because my doctor wants me walking too but sometimes it’s just too darn cold for anyone to be out for long. (I’m in one of those states that gets blisteringly cold in the winter, especially when the wind decides to get blasting cold and brings the wind chill factor well below zero). We do have fun walking though… in the fact that she’s a massive puller, I had a no pull harness, which is now no longer usable since she chewed one of the straps clean off so I went with what I used to use when I was a kid, the Halti Head collar, she hates it… and fights it and unfortunately I’ve got the smallest size they go and she still manages to get out of it so I’m going to try something different as soon as I can and that’s replacing the retractable leash with a normal leash and let the cat have the retractable one. For now, I’ve been using the retractable locked with about 4 feet of lead and using both hands, one on the handle and one on the lead itself, seems to help a bit and when she’s going potty, I’ll just unlock the handle. She used to have rope toys but because of her insistence of chewing and eating what she chews, (she was eating the rope thread after having managed to undo the knots on about 3 of the ropes), her vet said no more rope toys so they got confiscated. She’s got a lot of toys and I give her as much attention as I can give her during the day despite working from home but the tabasco sauce seems to be the best way to go for the moment until I can find the puzzle toys. She had a pretzel one that could have treats in it… that no longer exists, haha! She’s chewed it to bits and pieces that it is completely gone. The DIY YouTube video idea is awesome! The latch looks like it wouldn’t be too much of a hassle to open when you need to throw something away and it would be pretty easy to install. Thanks for finding and sharing that. ? My dog Cody does the exact same thing, chewing on tissue from the garbage bin. However, he only seems to be doing it when no one is watching. I hope it is just a phase and he will get over it very soon. Does Cody just chew the paper items or does he eat them? Haley loves shredding paper and cardboard boxes for fun, which is common in labs and boxers so we don’t worry too about about it. We actually give her boxes to shred since she always spits out the pieces. If Cody’s eating the paper, here are a couple of articles that might be helpful. Cody’s tissue chewing could be a phase, but the more he does it, the more likely it will become a habit. When Haley was a puppy, we had success with using bitter apple spray (found in any pet store) on things she wanted to chew. Maybe that would work well for Cody too. Hi Owen, I’m sorry it took a few days to comment back. Things have been a little crazy around here. I hope your puppy’s doing better and staying out of the trash. It’s always worrisome when they won’t eat, especially if they’ve been raiding the trash or have gotten into something that might be harmful. I hope the tips are helpful for avoiding any future issues, but it seems to be a hard habit to break for certain dogs, like Haley too. Our solution is to move the trashcan behind a closed door when we leave the house, just to make sure she doesn’t rummage through the rubbish when we’re gone. ? I have an older Pit that just started this. We moved the trash can into the pantry, but somehow he got in there as well. The garbage is now in the garage, but now our dog has now started getting into food in the pantry. He ate flour and dry rice. He broke out of his crate and I don’t want to make him an out door dog, but I am tired of cleaning up. Any suggestions? Oh boy, your guy sounds really determined, breaking out of his crate and eating flour and dry rice, yuk! ? I would try giving him something to work on while you’re gone, like a frozen peanut butter Kong or a food dispensing toy. Maybe if he spends some time working on those in order to get something to eat, he won’t feel the need to raid the pantry. If things get worse, you could check with your vet to see if there could be a medical reason that he’s so hungry. I know it’s really frustrating, but hopefully he’ll be happy with the food stuffed toys. ? My dog Clover is very intelligent, we have learned in recent months that she discovered how to get into our cupboard where our garbage pail is..we put a chain and lock on the cabinet door and she still managed to get trash out. Now we never thought this would happen.. But a few cabinets down she opened it and crawled the the space under our counters and got to the garbage.. Of course today we ate all the stuff that is bad for dogs.. She ate chicken wing bones, onions.. Raw potato. I am so heartbroken and devastated, I am awaiting the worst. But if the worst doesn’t come, I can only hope it doesn’t.. What should I do?!? I was thinking baby locks, but I truly fear she will keep finding a way. 🙁 she is my baby girl and I do not like that she scrounges so deeply for garbage. Oh my gosh, I hope Clover is okay. I can’t believe she got under another cabinet in order to get to the trash. She sounds incredibly smart and determined! I know it would be a hassle for you, but I think I would keep the trashcan in another room or in the garage and carry items out to the can as needed. It sounds like it might be too tempting for her if it’s in the kitchen area where she can smell it. I’m sending good thoughts your way that Clover is doing fine after what she ate. Please give her a special hug from me tonight. ? I too had an 18 mo. old golden retriever that began to “trash” the kitchen. Jake was a rescue that was 15 lbs underweight when I rescued him. Even though he had came with significant baggage, certain behaviours are not tolerated our home, and “trashing” is one of them. My vet suggested setting him up with baiting the trash with wet cat food then place 1 sheet of news paper then 4 set mousetraps and then another single sheet of newspaper. The sound of the snapping of the traps deters repeating the behaviour. It took twice, no more trash can digging. *Note: He was, by then, free fed, so lack of food was not the issue. This was a boredom/separation anxiety issue. That’s a good idea, Karen. I tried the Snappy Trainer with Haley and I think the regular mousetraps with newspaper would have worked better and the newspaper would keep the traps from accidentally making any contact. I’m glad that worked so well for Jake and thanks so much for sharing your tip! ? My 7 yr old terrior has been perfect until today. I caught her in the bathroom trash. Why would a dog who has never chewed anything up, never gotten into trash do this? I wonder if there was something unusual in the trash that maybe she was attracted to. Also, some dogs get into the trash because they’re bored or have too much energy. It is strange at her age that she would suddenly take an interest in it though. Did she eat anything (like tissues) or did she just rummage through it or tear up some paper? Go to the hardware store, bring the inside cupboard measurements, and get the staff to cut a piece of custom plywood for your cupboard and create a partition wall. It’s not rocket science, anyone with a screwdriver can do it. Half inch or maybe even 3/4 inch plywood will do the trick. If there isn’t anything to screw it to, then get a 2×2 length of lumber and cut sections to provide a nailing surface to the portion wall. And then stand back and revel in how smart a dog you have. Oh my goodness! I’m trying to picture your beautiful pointer’s face covered in tomato juice (and the floor of course)! They are really smart dogs and I bet he would have at least tried to drive a car, haha! I like your idea about the partition. I wonder if you could even put hinges on one side and maybe a magnetic closure to completely separate it, but allow it to swing open too. Hmm…now you got me thinking! Thanks for sharing your tip, Johanna! My 7 year old collie has been getting in the trash lately and I don’t know what to do. We are doing a DIY kitchen remodel and are cabinets are being painted so we can’t close in the trash like we used to. He is dieting right now because he is over weight and may be allergic to gluten so it may be the gluten free diet throwing him off but I have caught him doing it again for awhile he looks sad and sulks into the kitchen and I go in and find him in the trash again. We have another collie name Louie ( ps the other is auggie) and though we are pretty sure Lou would never do that behavior my mom and I are unsure. We run them together twice a day, me and my dad, so it can’t be energy and a trap may worsen his anxiety so a no go he went through the phase long ago and since he may be allergic to gluten but we eat gluten every day and he has been eating all the pasta and bread being thrown out. When my mom yells at he he is hurt when my dad does scared but me he looks utterly sad and ashamed. I think it’s because I am his baby and hates to see me mad but how am I supposed to react to this. Do you think I should put up a baby gate he has arthritis so he can’t climb up it but I keep getting sick wile renovation and that is when he does it most I am sick, I can’t keep babysitting him. Help. I don’t know if the baby gate would work he could still get in, and he has gum disease so he doesn’t like bones. I need this to stop, HELP me. The kitchen remodel sounds exciting! It’s probably going to be a struggle since Auggie is dieting and more hungry than usual and I can almost imagine that sad, guilty on his sweet face. Since the remodeling is temporary, I would use a baby gate or maybe even put the trash can in the garage. It might be a pain, but it’s only temporary and it would be less stressful than worrying about what he might get into. Excellent Article!! I came across your blog, and here I found information about How to Stop Your Dog From Getting Into the Trash. It’s helpful for us. Thanks for sharing this information. My two shitzu’s bobbie and billy are nearly 8 year old they have only just recently starting getting into the cupboard and emptying all the contents of the bin all over the kitchen floor, my husband picked it all up and put the bin outside. When i let them out to pee bobbie went for a second go right in front of me of course i berated her and her ears were well back she knew she had done wrong. I just find it frustrating because she has never behaved in this way. I cant take them out for walks as she constantly barks at anything and everything and its very embarrassing and find myself constantly apologising to other dog walkers, i know the barking is a fear thing but i just cant get her to overcome it and now billy copies her.